I have something on my mind that I’d like to share my take on. I was curious how much money the movie earned so I asked Google the question and it sent me to an article on the Washington Times. Here’s the two opening paragraphs from the Times article. It was a movie destined for failure — relying on crowfunding for its shoestring budget, garnering little to no attention among liberal media outlets and opening in only 673 theaters around the country. The first paragraph says it all. The producers could not find funding in Hollywood and had to crow fund the project. The liberal media gave the movie little attention and it only opened in 673 theaters. Star Wars: The Force Awakens by comparison opened in over 4000 theaters. Star Wars grossed over $250,000,000 million its first weekend while Gosnell movie made just over $1,200,000. Talk about David and Goliath; yet David was considered a success given the odds against it. The question is why or better, why didn’t? Why didn’t the movie receive hardly any attention and why was it so hard to fund despite having some pretty good actors lined up to play the parts? The October 27th issue of World Magazine did an excellent job of detailing the “why’s” in its article titled, Shop Of Horrors by Megan Basham. I encourage the reader to follow the link to this excellent article and publication. The first thing I’d like to point out is that the movie is about the trial of a serial killer. Why is Gosnell a serial killer? The fact is Gosnell snipped the spines of living infants who were delivered live during an abortion. A mother also died along with scores of live babies. The primary issue was murder as opposed to the gross malpractice which was much in evidence. .
Actor/Director Nick Searcy (from the TV series Justified) went out of his way as the director and as the actor defending Gosnell to argue that race and religion played a role in Gosnell’s arrest. In other words, the producers went out their way to make the movie about the trial rather than be overtly pro-life and having to work through laws that sometimes allow abortion and sometimes prevent it-like when a baby somehow survives the process. Perhaps the most revealing aspect of the movie came when it was admitted that Gosnell was sloppy in his procedures but no more inhumane of what took place in other clinics. Obviously, there are many other shops of horror. Perhaps the biggest horror story of all is the fact we are a nation that does not consider life in the womb to be life despite the rather obvious fact that it is. That of course is what the liberals and their sympathetic media allies feared and continue to fear-truth. Abortion takes a life; it’s simply of question of when during the pregnancy. The story was told fairly according to the Washington Times and World Magazine something the liberal media will never do because abortion is their sacred sacrament and never may the actual truth be told. Just consider how fast the Planned Parenthood scandal disappeared when it became known they were selling baby body parts. Here’s my take…Conservatives who are pro-life will never get a fair shake by the left-wing media or their cheerleaders in Hollywood. We’ve come to the point where we are surprised when we can find a fair shake in publications like the Washington Times and World Magazine and in my opinion on Fox News. So what can we do? For starters, we can support outlets that are fair and ignore the ones that are not. You know who they are. Second, we can pay attention when someone like the producers of Gosnell make a movie that is fair and speaks truth. Sadly, I missed the movie. It didn’t even show in my area and where it did show it was at a time that we could not make the trip. My plan is to rectify that as soon as possible. The movie will be out on DVD so that’s one way to support truth. It will also be available through outlets like Netflix or Amazon Prime where it can be purchased for streaming or just to rent. Ether way you support those trying hard to get the message out despite the odds stacked against them. This article appeared shortly after my initial post and is helpful since it comes from one of the producers of the movie. The Media Censorship of Our Gosnell Movie. A Tepid Response when Outrage is Required. characterized by a lack of force or enthusiasm: tepid prose; the critics’ tepid reception for the new play. Tepid is a great word to describe President Obama’s response to the latest terrorist attack in Jerusalem-a terrorist attack launched by who else, Hamas\Palestinians. 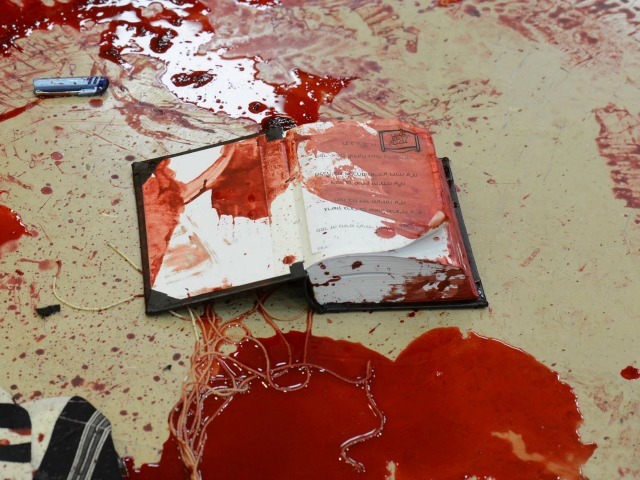 The attack took place in a house of prayer and left a number of Rabbis with duo western\Israeli citizenship dead. An Israeli Druze policeman died a bit later after the shootout with the terrorists that also left the terrorists dead. Total Israeli dead numbered five. Obviously. That’s why they elected Hamas to their government and have a President overtly sympathetic to Hamas\Jihadis even as he issued his own tepid response to the attack that at the same time condemned it and justified it. Obviously. That’s why Palestinians were dancing in the streets after the attack just as they did after 9\11. Obviously.That’s why we heard numerous Muslim clerics deplore the attack and condemn the attackers. No, wait a minute, we didn’t hear any. Where are the so-called Muslim moderates? What is the definition of a Muslim moderate anyway? Is it a Jihadi who just stops short of cutting off people’s heads? There it is, the moral equivalency response. Terrorists attack defenseless Israeli citizens in a house of prayer and Israel which warns defenseless citizens of an impending attack should show restraint. Never mind that Hamas hides its military assets among the civilian population in the hopes that Israel will kill civilians in their response. Hamas does this knowing full well that the western media will make much of the Israeli attacks and little of Hamas’ manipulation. The western media loves to make a victim out of the perpetrator. Hamas plays the western media like a fiddle. It is noteworthy that Israel’s President Netanyahu called on western governments to express outrage. The fact he had to ask western governments to express outrage is because like Obama’s tepid remarks the tendency of the west is to likewise be tepid in their responses to Palestinian outrages. The west with its bent toward political correctness and pacifism nominally fights ISIS in Iraq and Syria yet urges Israeli restraint in dealing with Hamas/Palestinians who are cut from the same cloth as ISIS. Go figure. 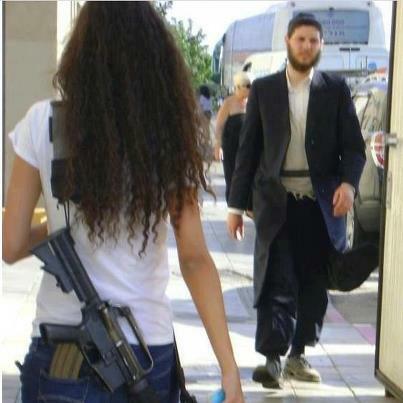 The Israeli government just relaxed the rules for Israelis to carry guns. That’s a response that makes sense. Perhaps if one of those hapless Rabbis had a gun the death toll would have been terrorists 2KIA and Israelis 0KIA or the attack would not have happened at all. Cowards do not like to face armed citizens. The defenseless make much easier targets for a coward. And the left wonders why we Second Amendment defenders like conceal and carry. Hamas and criminals is why. One can only conclude from Obama’s tepid remarks that he sympathizes with Hamas and believes there is validity to their cause if not their methods. 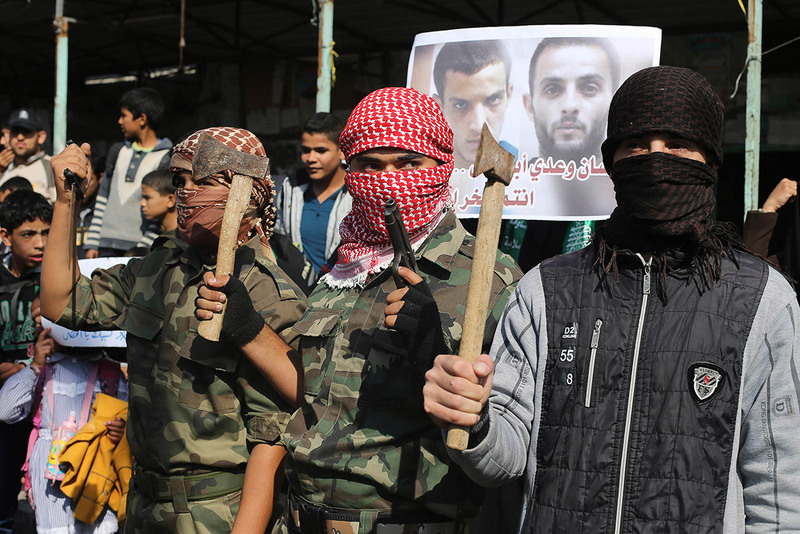 Note to President Obama: Hamas is sworn to the destruction of Israel and will not stop until that is achieved. And by the way, we’re next. At least two of those Rabbis were Americans. The other day I was flipping channels and stumbled on BBC-America. The title of the program on next immediately grabbed my attention-The Great Martian War. I even watched the 2005 version of War of the Worlds starring Tom Cruise (it was okay). So when The Great Martian War popped up I immediately knew the BBC was tinkering with a classic story. I spent the next two hours watching the special. The Great Martian War is an alternate history. 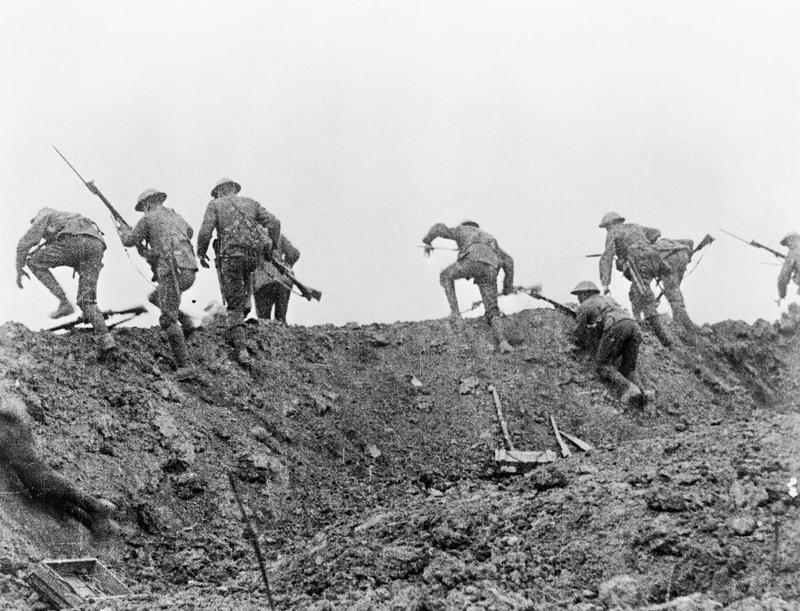 The war starts one year before the Great War started (1913) and ends one year before the Great War historically ended (1917). 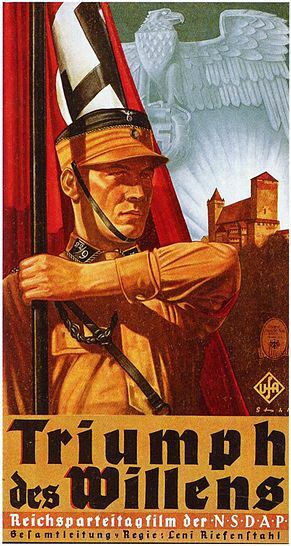 The twist on the Great War is immediate because the Martians land in Germany destroying a significant part of the Kaiser’s Army. The Germans call for help as the Martians begin to spread out. The result is a type of League of Nations alliance uniting (rather than fighting each other as they historically did) to destroy the Martians. The Great Martian War is cleverly put together. The producers took period film from the Great War and spliced Martian war machines into it creating a newsreel effect that was convincing. Still from The Great Martian War featuring the Martian war machines. The other device they used to give the alternate history an air of authenticity was the use of interviews. The producers had regular people who had survived the war tell their stories at various times during the special. Two modern-day historians are added to the mix to give their interpretations of the war. 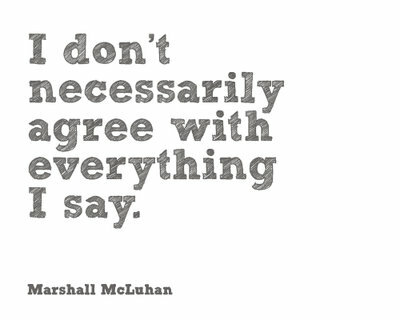 They do not agree. Most of the regular people are soldiers from Britain, Germany, Canada and the US. At least one is a civilian-an elderly woman who was a ten-year-old girl at the time of the invasion. All the actors did a fine job but her remembrances were particularly striking especially as she describes her emotions as she witnessed the destruction of a Martian war machine and the crowd’s vengeful attitude toward the wounded Martian pilot. The Martian War machines are virtually indestructible and come in two sizes. One is the massive tripod called a Heron. Herons are piloted by a Martian and might be compared to a modern tank except for their great towering height. Herons are protected by a force field and are armed with blasters (the heat guns of War of the Worlds). Herons are supported by “Spiders” smaller bipeds with blasters and nasty tentacles the impale people. Spiders are the infantry of the Martians. Against these war machines the allies marshal the typical equipment of the First World War-heavy artillery, early tanks, massed infantry and bi-planes. The tactic of “going over-the-top” was used in The Great Martian War just as it was in the Great War with the same results-huge casualty rates with little to nothing to gain. The war breaks down into a type of trench warfare with the allies using the tactics of massed infantry attacks to destroy the Martians. The casualties are horrendous thus reflecting the Great War’s butcher bill very well. The Martians win every time but seem contented with small advances. The US in neutral under President Wilson but is heavily criticized by former President Teddy Roosevelt who recognizes the danger of sitting on the sidelines. The US is finally pushed into war when the Martians (and some say the British) sink three American ships that were supplying the war effort. 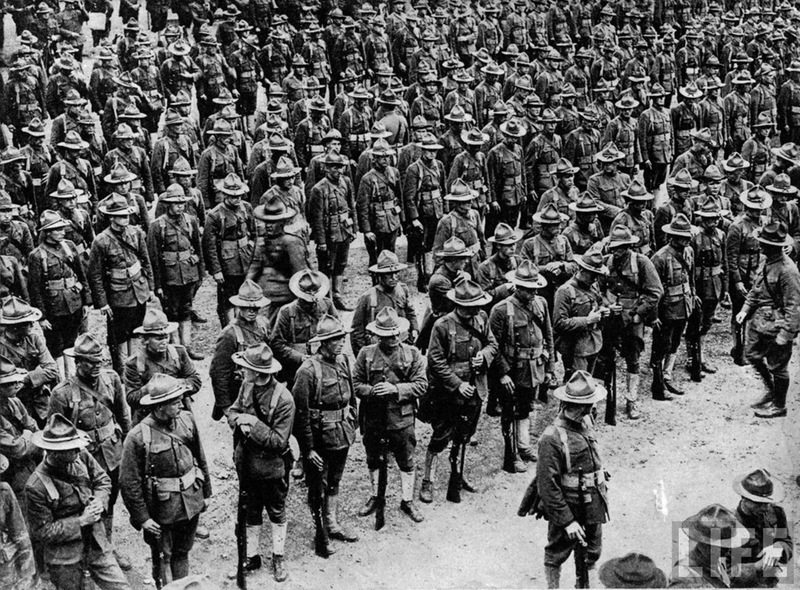 America entered WW1 in April, 1917. In The Great Martian War America also enters the war late but this time under the leadership of President Teddy Roosevelt who takes over after Wilson resigns. Wilson resigns and Teddy takes over and declares war on the Martians this giving the allies a new source of man power. It was an interesting segment in the special. The allies are desperate for America’s involvement but Wilson keeps the US out. The three ships are lost with all hands and everyone assumes the Martians did it except for a few that guess maybe the British did it to force the US to declare war. Another interesting story involves the great-granddaughter of a Canadian-Iroquois soldier who eventually decipher the Martian language. The allies get a break when they accidentally bring down a Heron with a massive under ground explosion. Seven Spiders surrender in the aftermath and the allies discover the Spiders do not have pilots but are controlled by the Heron pilots. The allies start to understand some of the technology used against them and begin to turn it against the Martians. The big break occurs when a Heron breaks through the lines and makes it way to London crossing the Channel in the process. Three fighter planes bring the Heron down using the captured technology and the Martian pilot is wounded. The crowd wants to tear the Martian to pieces but the Martian is “saved” by British police mounted on horses. The police take the Martian to a nearby hospital in an effort to learn about the enemy but the Martian quickly dies. 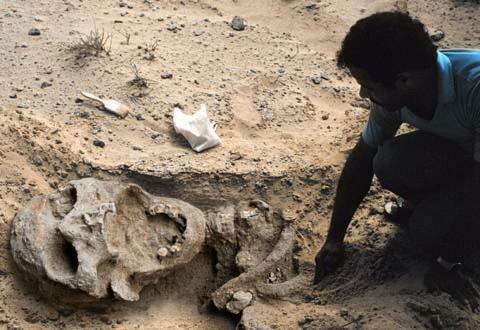 The autopsy reveals the Martian did not die from its wounds but from a virus carried by the policemen’s horses! The allies quickly realize that the Martians are vulnerable and mass produce the virus and infect every horse they can find with it. They launch one last ground offensive designed to get the Martians close to the massed horses and the horses do the rest. The Martians are killed by bio warfare in a similar fashion to H.G. Well’s classic except in that it was the common cold that brings the Martians down. The downside of the horse born virus is that it morphs and kills millions of people just as the post World War One Spanish Flu did (50 million world-wide). The Canadian Iroquois soldier decipher the Martian language and when it’s uncovered many years later it is discovered that the war is not over yet. And it that lies the message, although a bit ambiguous, it was ominous. I enjoyed the special. I thought it faithful to The War of the Worlds conceptually and the use of a documentary format made it an interesting alternative history. The obvious themes were the great nations uniting in the face of a common threat, the blessings and cursings of technology and the not-so-subtle suggestion that humans and Martians are all infected with a parasitical virus at the root of all wars. The War of the Worlds and it’s spin-offs have always intrigued me. I know that H.G. Wells was a visionary of sorts and his fiction was meant to be thought-provoking as well as entertaining and by and large it is. I also know that Wells was a Darwinian Socialist and that he rejected orthodox Christianity. To what extent his shifting religious views influenced his fiction I am not sure. 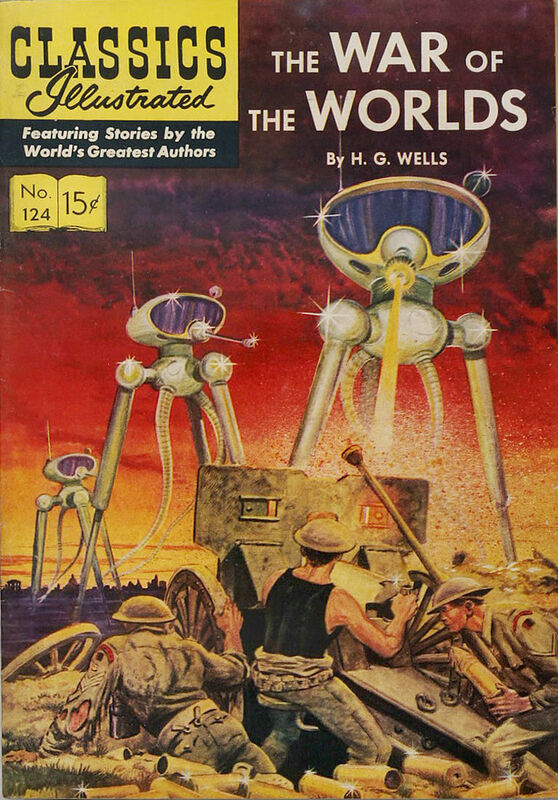 To what extent the world views of the producers of The Great Martian War and the War of the Worlds movies influenced them I am also not sure. I guess my biggest take-away from The Great Martian War besides the entertainment value is the notion that mankind is capable of some kind of unity if the threat is substantial enough. We’ve seen this historically on more than one occasion. We’ve also seen that the unity achieved during the threat abates rather quickly when the threat is dissipated and the allies, once friends, now become bitter enemies. A Darwinian like Wells might think long and hard as to why that is and ponder what the perfect World-State would look like but he would never arrive at the central problem. As the great scholar Pogo once remarked, “we have met the enemy and it is us” and the truth is we are the problem. We are the problem because we carry the stain of sin, a virus we cannot get rid of because it is embedded in our spiritual DNA. What we can do is look to the Creator and his solution to the sin problem-a Savior, Jesus Christ who came to earth to redeem and restore a paradise lost. 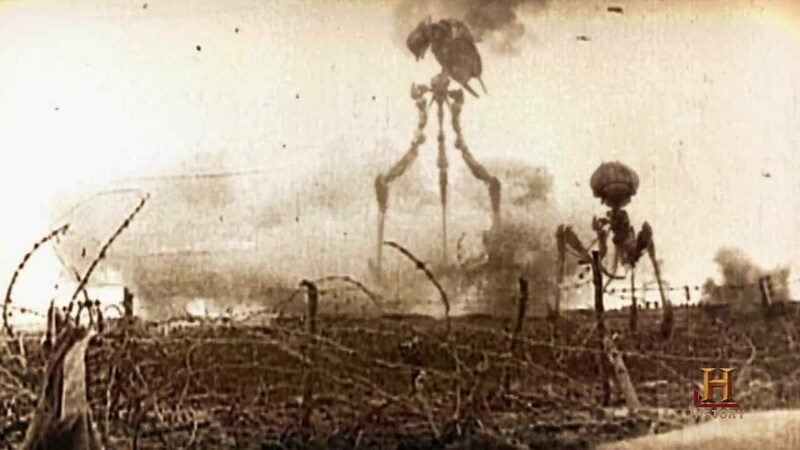 Whatever else might be said about The War of the Worlds it can certainly be connected to the war within us all if take the time to look. 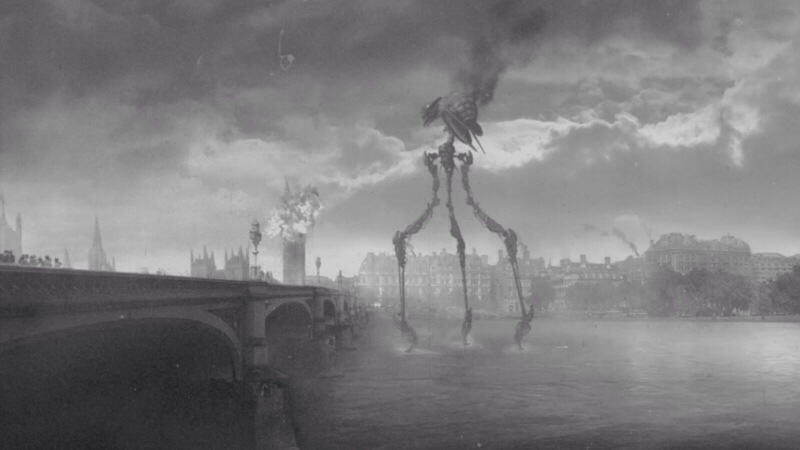 A Heron attacks London and destroys Big Ben before being brought down in The Great Martian War. Along time ago in a High School class that I no longer remember the name of I heard the phrase, “the medium is the message.” The phrase has stuck with me for over 40 years probably because of my interest in communications and how various forms of communications can influence public opinion or perceptions. I no longer remember what illustrations McLuhan may have provided in his book but he could have used Leni Riefenstahl’s movie\documentary titled Triumph of the Will. Triumph of the Will became a triumph of propaganda for Adolf Hitler and the Nazis but it did so because the medium of the cinema was masterly crafted by Rienfenstahl to rouse the German people to patriotism and to thoroughly embed the idea that the Nazis would lead Germany into a new age of European dominance (what would become the Third Reich). The film is a classic not for its resulting message (how the form of cinema functioned) but for how well crafted it was. Period poster advertising Triumph of the Will in German. The film’s imagery portrayed massive parades, heavy symbolism, military uniforms and rousing speeches from the 1934 Nuremberg Rally. The point is the way a medium functions is more important than it’s form (movie, radio, newsprint, etc.) because it can manipulate the message and thus steer people one way or the other. Another example of the medium is the message might be Darren Aronofsky’s new film, Noah, starring Russell Crowe. I have not yet decided whether I will watch the movie. I certainly will not pay for a movie ticket but I may rent it down the road simply out of curiosity and because I like Russell Crowe’s acting. Besides, it may result in more grist for my blog! What I would expect to find is a story told through the considerable talents of Aronsky as a director. The story may even be entertaining and I confess I am looking forward to seeing the rock monsters masquerading as Nephilim as well as the special effects used to create a really big flood. What I would not expect to see or hear is an accurate message from the Word of God. Frankly, I’d be on the look out for any inaccurate message from a movie that is supposed to be biblical. In the interest of full disclosure I’d watch Roma Downey’s series, The Bible, with a similar critical eye but expect less distortion. Evangelical critics have pointed out that the basic message of the film is that Noah is a vegan eco-nut in the movie and that God destroys the people of the earth because they are destroying the earth. I would consider myself a conservationist and certainly am not for the careless exploitation of the earth but I am also aware that God gave Adam (and mankind) dominion over the earth (Gen. 1:26). Dominion means the subjection and management of earth’s resources for the benefit of the ones having dominion. We can argue all day about what that looks like but the bottom line is that God intended that man manage his earth and that as originally intended that management would be done in a responsible manner. The reason it has not always been done in a responsible manner is because of the fall (Gen. 3:1-19) and by the time of Noah all that mankind did was evil all the time (Gen. 6:5). 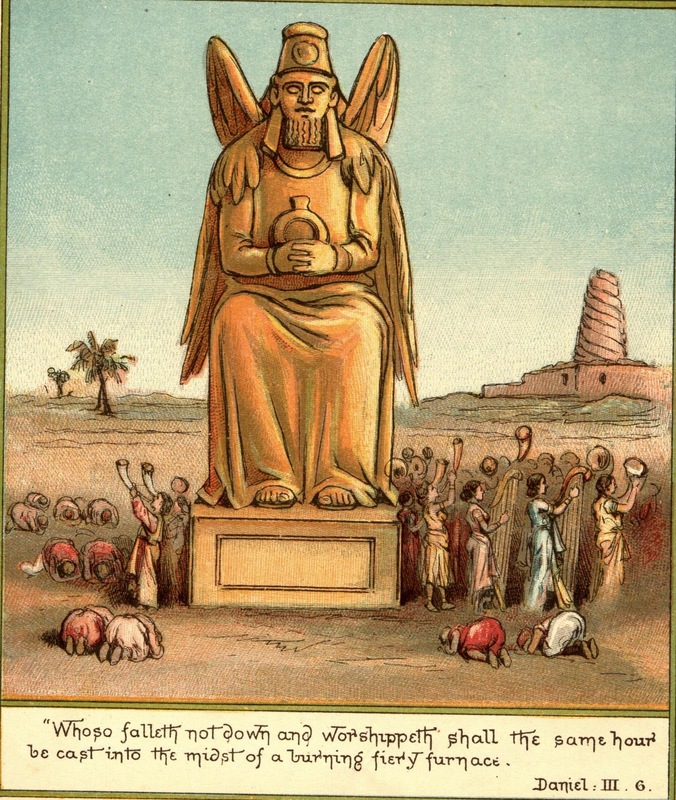 God destroys man except for Noah’s family (a total of 8) not because of one evil (misuse of the earth) but for all evil and all types of human depravity that resulted from the fall. When man fell he did not just stumble, he fell hard and every part of man’s soul has been corrupted by the fall. Genesis 3:15, called the proto-evangel teaches that God would provide a solution to man’s essential problem (sin, evil) and the story of Noah serves as part of the larger narrative that would eventually point to Jesus. What Aronsky and his helpers have done is provide an interpretation of Genesis that they claim is faithful to the text. It clearly is not. To be sure part of the motive is to make money and be entertaining but the other part may very well be a progressive agenda that is against fracking, big oil, whatever that means, nuclear energy, and for windmills and solar even though those resources are not reliable nor can they generate the power needed. One would think that the eco-nuts won’t be happy until we’re all living in the times of Noah as portrayed in the movie by being “one with the earth” rather than having reasonable dominion over it. I’ve heard that kind of propaganda all the way back to my High School days and the very first Earth Day which as I recall was May 1st, 1970. So, the medium is the message and Noah is probably a well-crafted movie that promotes a particular message, a message designed to influence people and as such is a piece of propaganda. It’s also creative license that results in a horrible interpretation of the Genesis story and as a result misses the main point of the story. In that, we should not be surprised because there is no way Aronsky has ever had a course in biblical hermeneutics where by the student is taught to do his best to get the biblical message right. If you chose to watch the movie understand that the medium is the message and in this case a horrible interpretation of what is taught in the story of Noah. Paul’s main concern was for the purity of the church not the Corinthian culture as a whole. I could be wrong but I don’t think I’ve ever seen a church with the word “Corinth” in its name. It would be odd if there were such a church. Corinth in the apostle Paul’s day was an immoral cesspool even by pagan standards and was well-known throughout the ancient world as such (and that is saying something). Paul took sin seriously and he took it particularity seriously when it occurred among professing believers like the Corinthian churches. He took it so seriously that the man mentioned in 1 Corinthian 5:1 got booted from the church because he was unrepentant. 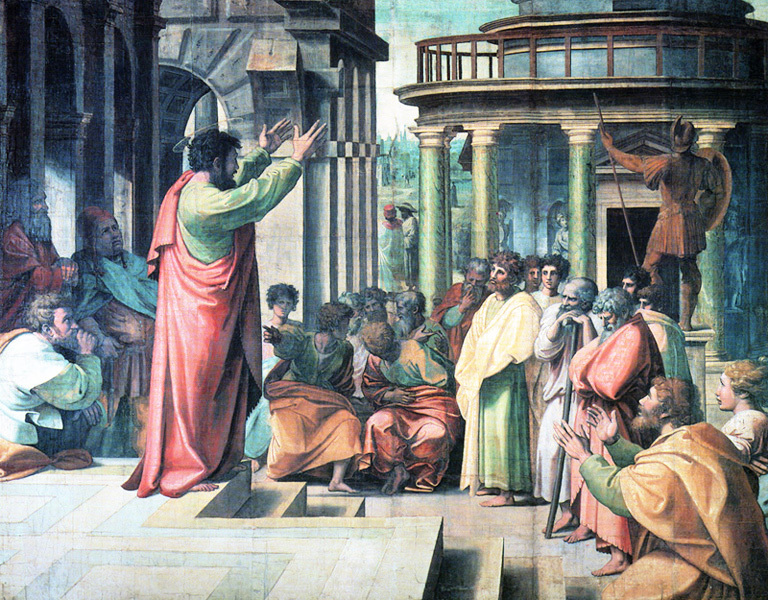 Paul’s priority was the purity of the church and not the Corinthian culture. Paul relied on the Spirit of God to change individual sinners from the culture rather than trying to turn around the entire culture. Jesus came to save sinners who knew they were sinners and not sinners who denied the word “sin” in the first place. Our culture, by and large, does deny sin especially when it comes to sexual morality be it heterosexual or homosexual. 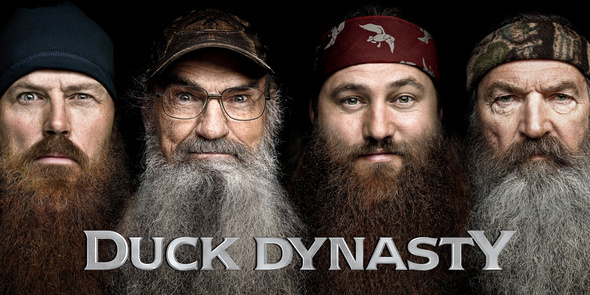 Phil Robertson of the popular A & E show Duck Dynasty was suspended (fired?) by A & E largely for paraphrasing 1 Cor. 6:9-10 and making a crude reference to the anatomy of women and what homosexuals use the anatomy of other men for. The LGBT crowd was predictably “outraged” when Phil made the crude reference although he was certainly pointing out the obvious. They were further outraged when Phil paraphrased the above Scripture and mentioned the most politically incorrect term of all, sin. Phil Robertson is on the right. Personally, I think it was only a matter of time before one of the Duck Dynasty stars said something politically incorrect and LGBT piranhas would smell blood and go in for the kill. The show was simply too popular, too wholesome and too funny without being filthy to remain a small target in a Corinthian culture that recognizes few if any boundaries. Statements from official LGBT groups included words like “vile” and “unscientific” and “unchristian” which is a bit amusing given Paul’s rather blunt and straight forward words on the subject. Perhaps Paul was not a Christian? Clearly A & E fears LGBT political correctness more than they value free speech. Bible-believing Christians need to recognize the playing field is not level nor fair. Robertson should have known and perhaps he did before he shared his biblically grounded opinion on homosexuality and sin. In fact, I rather suspect that Phil did know he was treading on politically incorrect ground. I further suspect that he’s not all that concerned about getting fired. In a related story it was reported he cancelled an interview with Barabara Walters (probably a set up) and went duck hunting instead. I suspect that Phil and family will do just fine without A & E.
Go duck hunting Phil and let the chips fall where they may. The free dictionary defines caricature as: A representation, especially pictorial or literary, in which the subject’s distinctive features or peculiarities are deliberately exaggerated to produce a comic or grotesque effect. The use of caricature to mock political leaders enjoys a time-honored tradition especially in the English-speaking world. 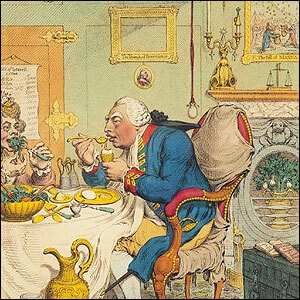 Below is a British example mocking King George III and his policies. King George had the dubious honor of being mocked by his subjects on the both sides of the Atlantic. President Lincoln was mocked as well through caricature. The cartoon below is from Punch, a British publication, famous for its ability to mock through caricature. 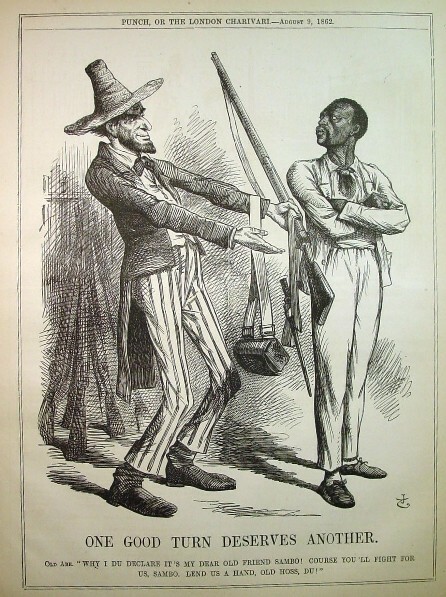 This one shows a foolish looking Lincoln trying to convince a freed slave to fight for the Union.The jab seems to have more to do with Lincoln’s policies rather than attacking Lincoln personally. Britain was pro-Confederacy during our Civil War. The caption would not pass a political correctness test today! The use of masks is another way to use caricature to mock a politician although the mocking is more usually personal than directed at policy. George W. Bush was relentlessly mocked, often very cruelly by the left. 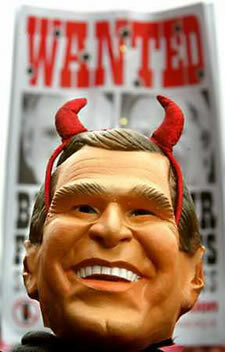 Here a person caricatures George Bush as Satan. George W. Bush mask as Satan. Mask caricatures of Bush were common while he was President, most were not flattering. Another caricature of George W. Bush, this time as an ape. 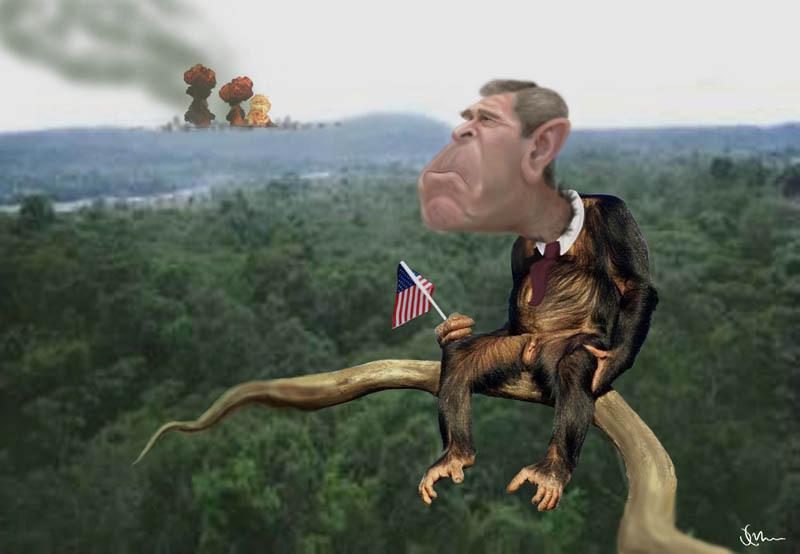 Caricature of George Bush as an ape. President Lincoln was also mocked as an ape. 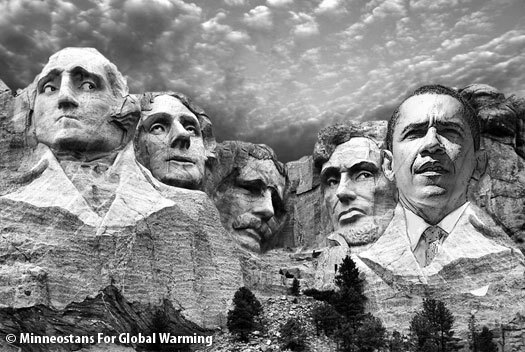 President Obama is also mocked via the use of caricature. The right can be just as cruel mocking him as the left was in mocking George W. Bush. In politics, mockery and caricature is par for the course. Most politicians expect it and man or wo-man up to it. The cartoon below takes a Sarah Palin quote way out of context and applies it to President Obama. Given the history of caricature and the mockery of political figures not to mention the First Amendment, I find it amusing and chilling that the rodeo clown who wore a Obama mask would be subject to sensitivity training and possible investigation by the Justice Department. 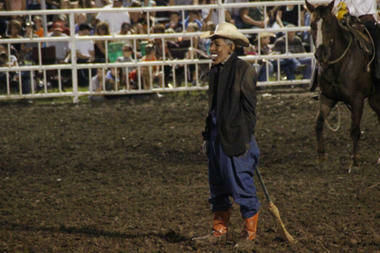 The rodeo Clown who sparked a media firestorm because he wore a Obama mask. Personally, I think there is a difference between a well thought out caricature and name-calling that demonizes an opponent. I think the two examples given above about President Bush and the one example regarding President Obama are simply name calling that tend to demonize. The one regarding Bush is blatant demonization and contribute nothing to debate as do personal attacks. The last picture is about the rodeo clown who wore a Obama mask during a performance at the Missouri State Fair. It now appears he will be banned for life at that fair and be subject to sensitivity training at the least. 1) Unless the clown violated some clear-cut rules or guidelines that prohibited the use of political masks of all types he should not be disciplined. Period. 2) While the use of the mask is name calling it certainly is not demonization. If something similar happened in the Bush administration or even the Clinton administration it would be news. The left is guilty of far worse and guilty more frequently. To have the Justice Department look into this is pure hypocrisy of the highest order. If the President was not so narcissistic he’d make some hay by poking fun at himself and let this poor off. Instead, it’s become a big deal. Sad. 3) One can argue what is in good taste or bad taste but the bottom line is we still have freedom of speech and expression in this country so to prosecute this man is to send a message: Do not criticize or mock our President in any way or else. This flies in the face in our Constitution, something the Administration does now on a regular basis. This should have a chilling effect on both the right and the left and to all thinking Americans. 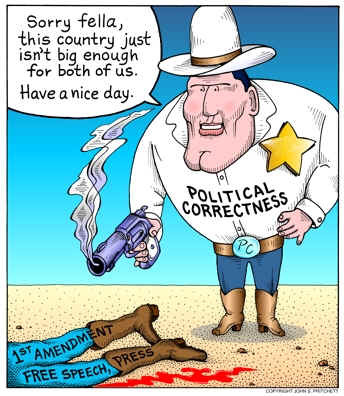 4) Political correctness is being used as a club to control thought as well as speech and action. When one group gets to define what is acceptable thought and speech you have a dictatorship and a persecuted minority that will not tow the party line. For all their yapping about diversity the left requires conformity and will use law to get it. Big brother is here and he looks a lot like the mask on a rodeo clown, although he certainly is not a clown and knows exactly what he is doing. Below is a great caricature that speaks volumes! March 5th was the 60th anniversary of Joseph Stalin’s 1953 death. He was 74 and had ruled the Soviet Union since 1924 after Vladimir Lenin had died. Stalin’s one time ally, Adolf Hitler, also had a state-run media that cultivated his cult of personality. The similarities between Stalin and Hitler go beyond their control of the media and the cultivation of image. Both dictators are responsible for the deaths of millions. Few Russians mourned Stalin’s passing in 1953. His successor, Nikita Khrushchev launched a program that was known as de-Stalinization, in part, because of the dictator’s paranoia and brutality. 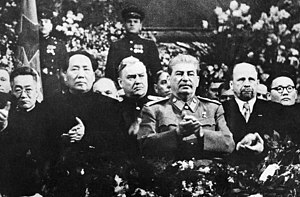 Unlike Hitler, who few Germans would think of fondly, Stalin’s image has received a new face-lift and many Russians remember “Uncle Joe” with admiration apparently forgetting or approving of the death of millions under his brutal reign. On March 5th, 2013, Hugo Chavez, dictator/President of Venezuela died. Chavez’s political party was the United Socialist Party of Venezuela and he had ruled since 1999. CNN calls Chavez an influential leader with a mixed record. His record is mixed because he spent millions of Venezuela’s oil money (CITGO) on social programs and was a virulent opponent of capitalism and hence, the US, which is why Chavez is celebrated by the American left. Chavez once called George Bush the devil and the left loved it. Venezuelans loved Chavez and his adoring throngs are now in national mourning. The state-run media in Venezuela has always been keen to promote the cult of Chavez’s anti-Americanism. It’s also worth pointing out that Chavez was friends with Iran’s Mahmoud Ahmadinejad and of course Castro, all lovers of a free press and dissent. Opposition to Chavez was not allowed. Chavez regime, like Stalin’s, like Hitler’s, like dictators everywhere crush all opposition and dissent, both real and imagined. That’s what dictator’s do, one way or the other. I think it was Margaret Thatcher who correctly said, ‘the trouble with socialism is that eventually you run out of other people’s money’? The remembrance of Stalin’s passing and the actual passing of Chavez got me thinking about President Obama who has said a couple of times he is not a dictator, although some on his side of the aisle and perhaps Obama himself wishes he were. The king thought highly of himself and I can’t think of a dictator who did not or does not. An inflated self-image and massive ego seems to be part and parcel of what it means to be a dictator. Some have noticed that the President seems to fit the profile especially when he channels Abraham Lincoln. Dictators have to be thought of as great by the people they dictate over. Who can forget the films of the adoring masses that assembled for an Adolf Hitler parade. This is why they have to control the media. This is why Bob Woodward, no right-wing conservative got his nose out of joint when not so subtly threatened when he pointed out some rather obvious inconsistencies with the administration. When people think the dictator great or some kind of messiah this enables the dictator to oppress and/or demonize the opposition. The story line goes like this. The dictator is a man of the people and he is the one who must destroy those who would oppose the people. Stalin, Chavez and dare I say Obama may differ by scope and scale but they all fancied or fancy themselves warriors of the poor and down trodden. “Fairness” as defined by the dictator is their flag as if who could be opposed to what is fair. The state-run media will assist the dictator with his agenda and will never point out that the dictator is not all that he is cracked up to be. And if the media should revolt, beware, dictators do not like having it pointed out they are dictators, hence Obama’s denial that he is one. Me thinks he protests too much. This is why the opposition to Obama is always racist, why the opposition wants the elderly to starve, why the opposition wants children in over crowded classrooms, why conservatives are responsible for global warming, and hate Latino’s, have a war on women, favor the rich and greedy and are responsible for smelly feet around the world. The dictator must promote and protect his own image while destroying the image of any and all opposition. His reward will be an adoring public and the sad thing is, it often times works. Some might object that I mention President Obama in the same post as Stalin because the President is not responsible for the death of millions. Fair enough, they certainly are different in that regard. But as one young man told me, I think Stalin did a lot of good but went a little too far. That’s the thinking of a Marxist. The death of millions is simply the extent of control that a dictator like Stalin could obtain. But comparing the President to Chavez is not so great a leap. The President will never admit to being a socialist. It’s not good for his image at this point. He’d rather be a progressive and put some distance between himself and the likes of Chavez. On the other hand, his actions or inactions speak louder than his words and I believe he has more in common with Chavez than he does with Abraham Lincoln. There is more than one path to dictatorship and the President already has an adoring media as well as an adoring public. If he destroys the Republicans with his demagoguery by 2014 there is no stopping the man who would be king.